This last weekend I went to the Hollywood ArcLight to see "Jackass 3D" and while I enjoyed the film (for the most part) the glasses I was forced to wear were crazy annoying. Now days we have two kinds of options when watching 3D. 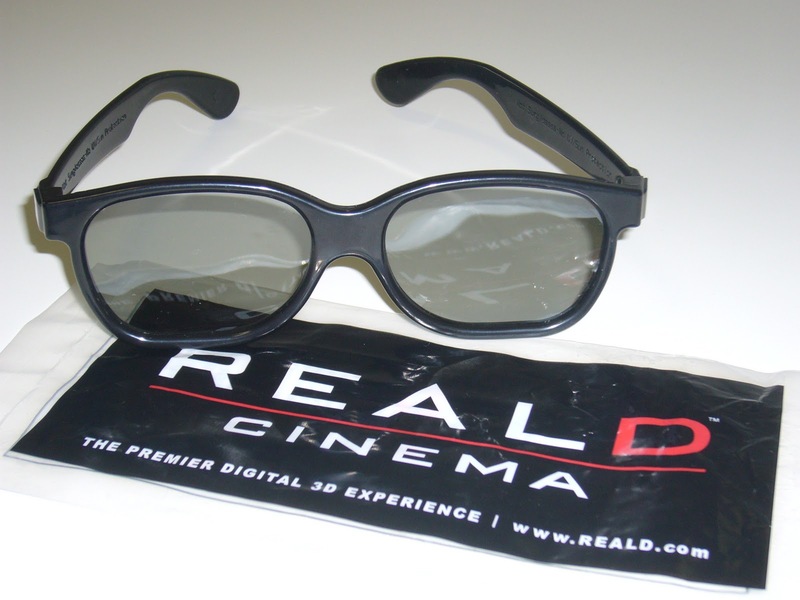 There are Polarized 3D glasses (RealD) or the Eclipse method (XpanD). ArcLight theaters use exclusively the Eclipse glasses or XpanD. These glasses have a mechanical shutter that delivers images alternating between left and right images. These glasses are heavy and become tedious to keep on your face after a short amount of time. I went with a group of 5 guys and all of us were in agreement that the glasses used at the ArcLight are annoying to wear and deteriorate the experience. Not only are the XpanD glasses a pain to wear, they are extremely dark and seem to make a once vibrant image dull. James Cameron's Avatar is a perfect example. I saw Avatar in the Dome at the Hollywood ArcLight just like I did Jackass 3D and the image was simply too dark. I was later surprised how much more bright the film was in a RealD 3D experience at another theater and even more so at home on Blu-Ray. ArcLight says that XpanD or Eclipse format is the only way to project a 3D image in the Dome, but what about the rest of their screens? ArcLight (for now) has 3 major multiplex's in Southern California. Only 1 of those locations has the Dome and needs XpanD, yet anytime you see a 3D movie at any of the ArcLight locations you are stuck wearing the heavy XpanD eyewear. Now ArcLight has gone on record saying, "Our guests have come to expect the best movie-going experience possible," but the XpanD format is certainly not the best experience by any means. This year I've seen close to 10 movies in 3D. The times I saw a 3D movie wearing the RealD glasses, I enjoyed the experience far more than I did with the XpanD eyewear. RealD glasses are extremely light so much so, I've even forgot I was wearing glasses at times. This has never been the case with the XpanD glasses. Never had I felt like I needed a break while wearing RealD glasses, where with XpanD I am prone to taking off the glasses a number of times to alleviate the pressure. Every XpanD experience I've also walked out with a headache, where RealD, I've yet to get a headache, even with some of the poorer 3D experiences i.e. Clash of the Titans or The Last Airbender. Another point worth praising when comparing RealD vs. XpanD glasses is the darkness. RealD glasses do not feel like I'm wearing sunglasses in the movie. In other words I can take off the glasses and see the same color vibrancy as I had with the glasses on. As previously stated, this is not the case with XpanD, their glasses darken the image by at least 30%. This comparison can also be taken to the home. Recently when I went to the 3D Film Festival in Los Angeles the TV's on display were all utilizing RealD instead of XpanD. I've looked at some XpanD TV's in the past and once again, the glasses were nothing but a pain to keep on my face. Shouldn't the 3D technology along with the people making the eyewear realize the glasses should be as light and invisible as possible? Who wants to wear a pair of clunky battery operated glasses while watching a movie? No one, thats who! Moving forward, I'm making the decision to no longer see 3D movies at ArcLight cinemas until they remove their exclusive deal with XpanD. I love the ArcLight theaters, it is my favorite multiplex to attend in Southern California, but as long as they continue to only offer a tedious 3D going experience, I will just go to another theater that offers RealD 3D experience. I go to the ArcLight for a higher brand of movie watching, but the fact remains that right now they are over-charging for a lesser experience. Take my most recent viewing for example. I paid $18.50 for Jackass 3D in the Dome. Granted we selected our seats and had zero wait time, but at my local AMC or Regal Cinemas I could've saved $4 and would've walked away without a headache or heard zero complaints about the eyewear. 3D should be seamless. I want to walk out of a 3D movie and not have to complain about the glasses or the brightness. The 3D technology itself is another story, but the glasses should not be a deterrent, and what the ArcLight currently offers with XpanD is exactly that. You're leaving out the Dolby chromatic glasses, which use the same idea as the red/blue anaglyph glasses but use a rainbow of colors. I saw a showing of UP at Arclight Sherman Oaks with the Dolby system and I've also seen movies at The Grove with this tech. IMAX 3D is polarized too, but doesn't have the reflective screen or higher frame projection rate as RealD. I find Dolby inferior in both strobeyness and image quality, because of the color fringing in the peripheral vision I get from their glasses.